Earn Money Off On Gas Purchases! You are here: Home / Sponsored / Earn Money Off On Gas Purchases! Hubby and I do a little traveling in the summer to blogging conferences mainly. I have shared with you before how we travel inexpensively. 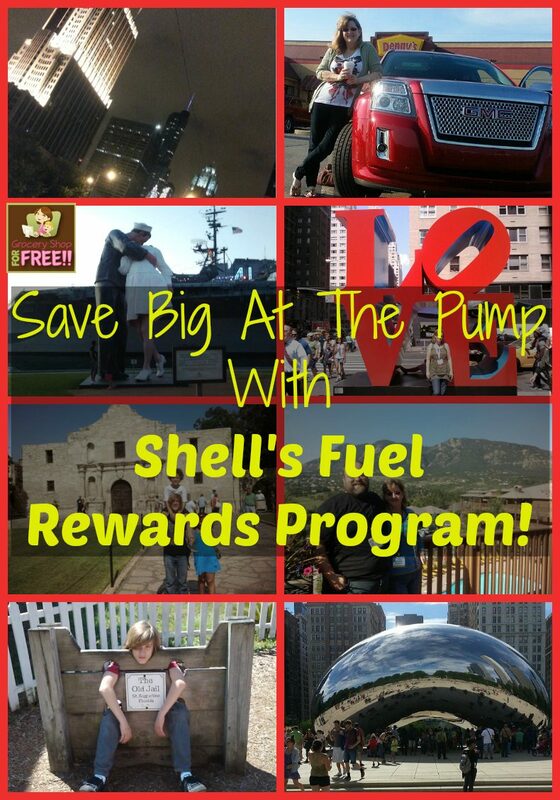 One of the ways we save on gas is to use fuel rewards programs, such as the Shell’s Fuel Rewards program. With Shell you can join the program for FREE and link up your debit and/or credit cards and earn money off your gas while doing your normal shopping and/or eating out! You can even link up your grocery store rewards card and earn money off your gas purchases! You can shop online and earn as well as use ecoupons and earn. This is a great program to cut down on what you pay for gas throughout the year. Why pay more for anything? You can even earn by sharing with your friends how they can save on their gas purchases! There are many ways to earn rewards to cut down on the cost per gallon for your gas. So, whether you are vacationing or Staycationing, be sure to sign up for FREE to get money off on your gas purchases!